The house we had was 4 bedrooms, 4 1/2 baths, swimming pool and a great staff. You can access the entire resort on your golf cart, unless you want to leave the compound to go grocery shopping in La Romana. There is a large marina area that has wonderful shops several restaurants, a small grocery and plenty of parking for your golf cart. The second night we had dinner at Limoncello in the courtyard of the marina. Limoncello offers Italian food and wood fired pizza. The portions are very large so think of sharing. We sat outside under the stars then walked over to the amazing ice cream shop next door and indulged in large scoops of Italian ice creams. We started our mornings around the pool and then we would all head to the lovely white sand beach. The water has a very gentle wave, fine for young kids to swim in the 90 degree water. 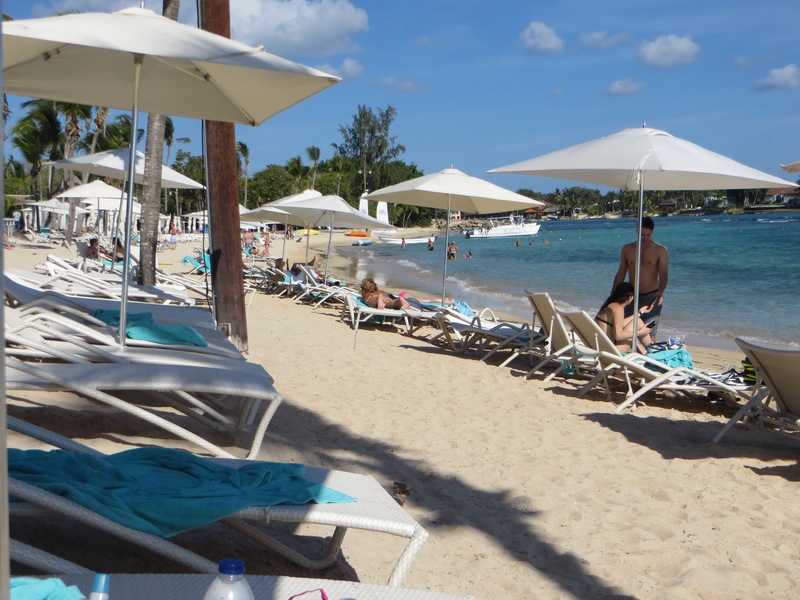 Lunch at the beach restaurant, La Cirque, was excellent for adults as well as the kids. The beach staff was always ready to serve you drinks under the palm trees or umbrellas and there were plenty of towels at the hut when you arrived. I even had a great massage on the far end of the beach while the waves broke on the sand a few feet away. The men played golf and even had a couple of lessons from the pro to hone their skills. One day we all jumped into the golf carts and handed up to Altos de Chavon, an old fort looking town several hundred of years old that has been all restored to it original charm. Now housing several restaurants, lovely shops with local fare and a small church waiting for the next wedding to fill the pews. That night we returned without kids, great babysitter arrived arrange by the house staff. The restaurant, La Piazzetta was very busy with a small local group playing for the diners. The portions once again are quite large so the chef was happy to split the courses. The fresh local tomatoes for a salad course was delicious, especially since we had not had fresh ripe tomatoes in Seattle for months. One day for a change of pace we went to the hotel to swim in the pool and have lunch. It is lovely, but we all agreed the beach was way better and the food was not great. We did love the swim up bar in the large pool and the work out space was excellent with many top machines. The last night we went back to the marina and ate outside under the stars at Peperoni. The service was fast and the pizza was perfect for the kids. Once again the protions were large and we would have been better off sharing the pasta and the salads. It was a great week, perfect for families and I think it is a place to return to. When we left and flew back to Miami we had to transfer to Fort Lauderdale and it is impossible to make the only nonstop flight back to Seattle the same day. Plan on staying either in Miami or Fort Lauderdale and catching the flight the next afternoon. 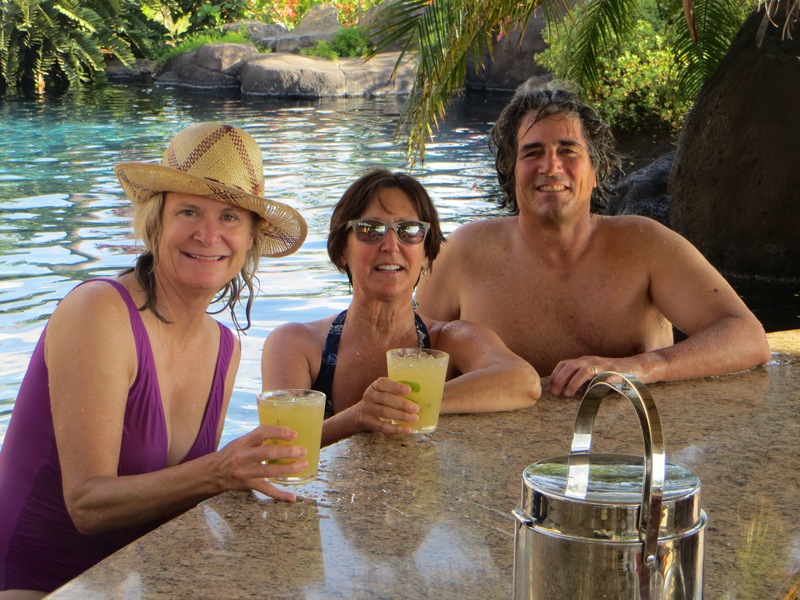 We joined a group of friends at a private home on the grounds of The Mauna Kae resort. We only had 5 days to play and explore so we filled each day and evening with the next adventure. The first day we headed to the farmers market up by the old Parker Ranch. The local veggies, breads, bacon ,cookies, pies and jams filled our baskets and our minds with what we would prepare for lunch later that afternoon. After a great day in the sun, reading and relaxing we cleaned up for our big night out. The Blue Dragon is an open air bar, restaurant and dance floor with local music in an area called Kawaihae, about 15 minutes from The Mauna Kae. The food was pretty basic, fish tacos, salads, grilled fish platters and an array of appetizers. They did have a couple of nice specials including a lovely Udon with fresh spot prawns. The crowd was a mix of local folks that come often to dance and tourists that come to watch. Th next day we did a walk to the area along the beach where the nature conservancies are working to save the many turtles. You will pass the house built by the late Paul Mitchelle with a true Balinese roof. Continue walking to the fresh water pools where the turtles are swimming when the tide is in and then head back out to the local beach as the tide begins to change. That evening a local cater, Michael Bickers, m.bickers@icloud.com, 1808-990-2644, came to house and prepared a lovely Hawaiian dinner using local fish and vegetables. A perfect way to end the day. Day three was spent on the white sand beach of Mauna Kae. They have some pretty good wave action on this beach, but that did not keep the people from swimming out to the the raft anchored in the bay. We made dinner at home with all the stuff gathered from the farmers market and the boys played dominos while we cleaned up. Some of the group played golf the next day at the Nanea Golf Club while the rest of us went swimming and took time to read our books, that is why we were there to begin with. Dinner was at a friends home that evening so we had no pressure to be creative. The home we were staying in was built by a doctor named Ray Lagger, but his real love was for the gardens he created using local plants. The house is 5 bedrooms, 5 1/2 bathrooms with a lovely open floor plan. The pool has a water fall that cascades down hiding the hot tub set back in the stone walls. The other end of the curving pool hosts a wonderful swim up bar covered with a large palpa. The gardens give the property a wonderful cool refreshing feeling and rest from the dark lava that surrounds the area, plus a lovely view of the ocean beyond. The house is owned Sarah and Dave Woodward’s family and can be rented when they are not there. —–Contact Sarah direct at drawdoow5@aol.com for rental information, a great place for friends and family to share and you get the use of the Mauna Kea facilities. The guys went fishing one morning while we did a hike to the local hidden beaches along the ocean front. They did not bring back our dinner so we went out to the Nanea Golf Club for a wonderful dinner and view across the golf course to the ocean beyond and sunset. Thank you for a wonderful time in a beautiful part of the world shard with friends.